Conflict over the issue also affected the CMA. At its 2005 annual meeting in Edmonton, its student doctors debated the issue of privatization with representatives from the provincial associations, the students arguing that existing evidence did not support the belief that private care would shorten wait times in public facilities. The interns and residents also pointed out that shifting to private service would compromise the key value of equality, and denied that they were being “naïve and idealistic” in stating that “no Canadian should be classed higher or lower than another when it comes to access to health care.” In response to the CMA General Council, which voted 122 to 67 in favour of private health insurance and private health services for patients who could not get prompt access to medical services, the CMA prepared It’s About Access! Informing the Debate on Public and Private Health Care, a document that offered four choices for the future of the system. The four choices included “(1) the status quo; (2) medicare plus, which involved evaluating services, allowing opting out and permitting Canadians to buy private insurance and seek care elsewhere if wait times were exceeded; (3) medicare complemented, which expanded the number of privately funded services and allowed doctors to practise in both the public and private systems; and (4) medicare plus private parallel insurance, for a full range of hospital and medical service” (Wayne Kondro and Barbara Sibbald, “CMA Proposes Options for Private–Public Split,” CMA Journal 175, No. 1 [July 4, 2006]; doi:10:1503/cmaj.060712). An opinion survey found that only 15 per cent of respondents supported the fourth option and that Canadians still highly valued comprehensiveness and equity in health care. In Charlottetown at the CMA’s 2006 annual meeting, interns and residents, now joined by the newly created Canadian Doctors for Medicare, again challenged the frustrated and somewhat embittered senior practitioners to demonstrate why the privatization proposals in the CMA document were the only solutions that should be considered. 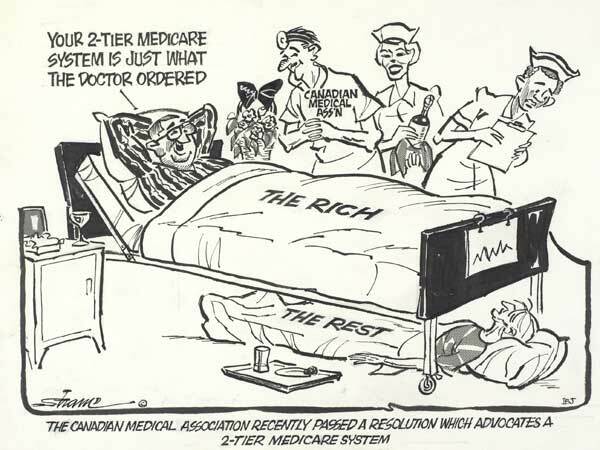 George Shane’s 1992 cartoon was equally well suited to 2005, when a majority of the members of the Canadian Medical Association supported private health insurance for patients who required prompt attention. Library and Archives Canada, Acc. No. 1995-16-77, e008440952. © George Shane. Your 2-tier medicare system is just what the doctor ordered.